Review Summary: Four Bihari criminals hit Mumbai for a hit-job. One falls in love with the victim - what explodes? 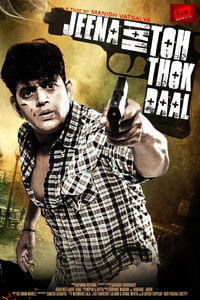 Jeena Hai Toh Thok Daal is a very hideous and pretentious film that doesn't make for a good watch. Manisha Vatsalya should take to acting a lot more seriously than make a film. Four Bihari criminals hit Mumbai for a hit-job. One falls in love with the victim - what explodes? Released on 14-9-’12 at Shalimar and other cinemas of Bombay by Rash Productions. Publicity: okay. Opening: dull. …….Also released all over. Opening was weak almost everywhere but good in parts of Bihar where it has been shot. Come on now, should audience indeed be subjected to such crudity on the big screen? Fair enough, so cuss language in Bollywood is in and has pretty much come in vogue now and not many seem to be complaining.